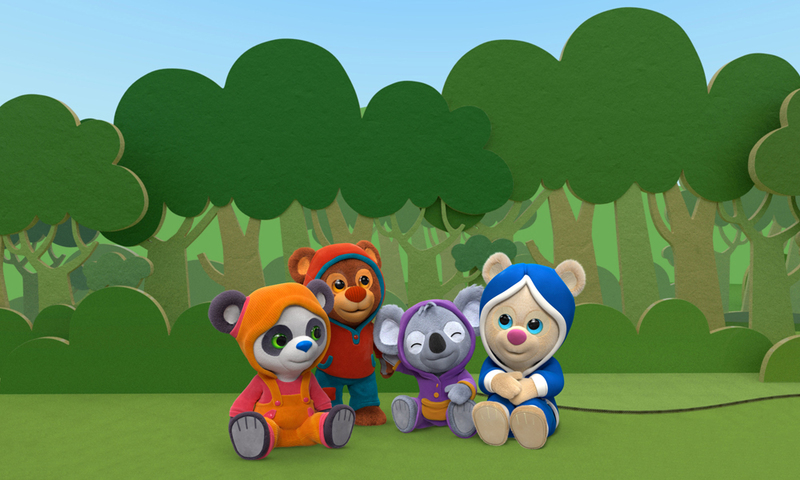 Pūkeko Pictures (New Zealand) has brought on Breakthrough Entertainment (Canada) and Hengxin Shambala Kids (China) as co-production partners for the new CGI picture-book preschool series Book Hungry Bears (52 x 11’), which has been commissioned by Canada’s TVOkids and TFO, in association with Knowledge Kids. The Book Hungry Bears — Crystal, Boomer, Melody and Scout — love picture books. Every day, they go on adventures to catch one of the books which flit and flutter like birds amid the paper trees in their magical, paper world. Every adventure finishes with the bears successfully finding a story to share. They cuddle up close and settle down to share their delight and engagement with the book as they ask each other questions, point to the illustrations and get caught up in the story. The bears’ adventures take place in a crafted world of paper and cardboard that every family can recreate on their kitchen table. Book Hungry Bears is created by and based on an original idea from Pūkeko Pictures’ Co-Owner and Chief Creative Officer, Martin Baynton, an internationally renowned writer and illustrator of more than 30 children’s books, including Jane and the Dragon and the Fifty the Tractor series. Book Hungry Bears is produced with the financial participation of Shaw Rocket Fund and Canada Media Fund and produced in association with Knowledge Kids.